One of Christian Borle's many characters in "Little Me." Based on the 1961 novel of the same name by Patrick Dennis, “Little Me” tells the story of imaginary diva Belle Poitrine, and the six oddball lovers she took during her life. Borle plays all six of the lovers, ranging from innocent college boy to the dying king of an non-existent tiny European country. (Rachel York and Judy Kaye split the role of Belle). NBC4NY: There are so many big names behind “Little Me,” it’s kind of surprising it wasn’t a bigger hit. I mean, music by Cy Coleman, lyrics by Carolyn Leigh, and a book by Neil Simon?! BORLE: Neil Simon is so funny, and just like a scalpel. His joke setups are classic and clean and ornate and still surprising. There’s an entire scene in Act II that leads to a punchline. And it’s not the funniest scene in the show, but it goes on and on and on and on until you realize that the last line, that’s where the whole thing was headed. There are little moments like that for every character that I’m really looking forward to. I feel lucky. NBC4NY: Had you seen the show before? BORLE: I saw the 1998 revival with Martin Short. I was a huge Martin Short fan growing up. I was a co-founder and president of the Ed Grimly Club in high school. So I was obsessed with him. To see Martin Short live was like heaven. He killed it. It was so good. It’s been interesting to approach these characters and try to put my own spin on them. There’s one gag that I stole, not from his performance in “Little Me,” but from his performance in “Arrested Development.” I think it’ll be quite obvious what it is. NBC4NY: What’s the biggest challenge of playing so many different roles in one show? BORLE: I just try not to overthink it that much. Sometimes simple is best and the first choice can be the best choice. For something like this, the challenge is actually making each character grounded and real, as opposed to caricatures. When I talked to John Rando, the director, who is endlessly inventive and funny, he was on the same page as well. He wanted there to be a heart to it and an actual love story. You should kind of like all these characters. They get a little big sometimes but I think they might be close to people. NBC4NY: This is your second Encores! show, after 2008’s “On the Town.” How does this process compare to working on a full-fledged Broadway production? BORLE: Well I don’t want to say there’s no pressure to it, because there’s pressure to get the show on. But what’s so nice about Encores! is you’re just doing theater. You’re honoring a piece of theater that’s this gem. And you know it’s going to be a bright shining moment in time and you don’t necessarily have to worry about box office and reviews and longevity and all the other stresses of “Broadway.” You’re just going to put on a great show. NBC4NY: NBC’s “The Sound of Music Live” was so such a big hit. And you won your Tony for playing Captain Hook in “Peter and the Starcatcher.” Have people been poking around about you joining the upcoming “Peter Pan” live televised production? 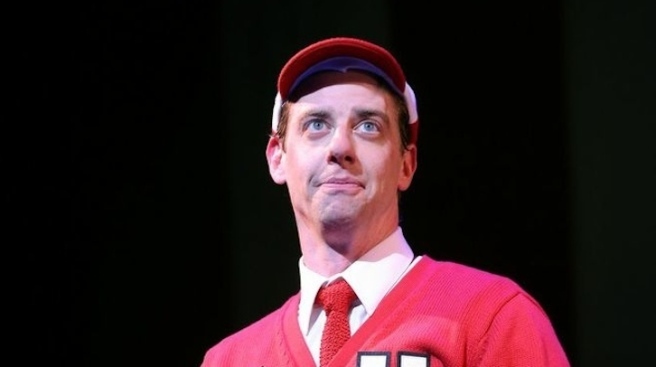 BORLE: Not the people that that I want to be poking around about it! “The Sound of Music Live” was the craziest thing. Not for 50 years had anyone attempted to do it! We had a blast. I’m so happy that so many people watched so that NBC will continue to televise live musicals. And it employed so many theater people. When I saw they were doing “Peter Pan,” I’m obviously not an idiot, I put two and two together. But Captain Hook is probably not realistic because they have people to pull in and I’m not going to pull in millions of people. So I think they’re probably going to get someone really fancy for Peter Pan and someone really fancy for Captain Hook. But I wouldn’t mind playing Smee! I hope that they think of me. It would be really nice if they had a repertory feel to it. “Little Me” runs at New York City Center Feb. 5-9. Tickets start at $30 and can be purchased at the New York City Center Box Office (West 55th Street between 6th and 7th Avenues), through CityTix at (212) 581-1212 or online at www.NYCityCenter.org.